When Michelle Obama joined US President Barack Obama on his visit to Saudi Arabia on Tuesday, many Saudis on Twitter focused on the fact that she was not wearing a headscarf rather than the outcome of the diplomatic visit. The couple were visiting to offer condolences after the death of the late King Abdullah, and strengthen US ties with his successor King Salman. Members of the US delegation crossed party lines and included former Bush-era officials, according to AFP. On Twitter, Saudis launched the hashtag #Michelle_Obama_NotVeiled in criticism of the first lady for not covering her hair. In contrast to Saudi women, who are required to dress head-to-toe in black, Michelle Obama wore dark slacks and a blue top with her hair uncovered, reported AFP. Saudis on Twitter also drew comparisons to Michelle's visit to Indonesia, where she covered her hair while visiting Istiqlal Mosque. They argued that, as the first lady was paying tribute to the late King Abdullah, she should also have covered her head in respect. Saudi Arabia is considered to be home to Islam's holiest sites, while the king is called the "Custodian of the Two Holy Mosques". However, some Saudis on social media also said that they understood that it was a short visit, and urged others not to criticise the wife of the kingdom's most important ally. One woman even asked her fellow Saudis on Twitter not to "make Obama angry at us". The United States and the Kingdom of Saudi Arabia have longstanding ties and remain bound by shared interests in regional stability and oil, according to AFP. You know what? The Quraan doesn't say ANYTHING about covering our hair. It says be modest! And you don't get more modest and elegant than Michelle Obama. Muslim men around the world, STOP TELLING US WHAT TO WEAR! stop telling us your version YOUR VERSION of the Quraan because you have insecurities YOU can't control. I am NOT covering my hair becaue someone says "Scholars believe..." NONSENSE!!!!! If you can't control yourself you have the problem. I'm sick to DEATH of them telling us what to do. And Saudi has made it a nightmare for ANYONE to attend Hajj US Media doesn't show them killing people who pray wrong during the pilgrimage because they are in the US's pocket. Women stop being cowards and ignorant pricesses and say NO I'm NOT WEARING THIS! For God's sake this is the 21st century and we are no better off than we were 1500 years ago. Lived there, They are a sorry use of God's creation. Lived in saudi, it sucked. Very disrespectful on Michelle's part. She should have known better. If it is ok for Muslim women to wear their traditional clothing in other countries, why cant we wear our normal clothing. Mrs. Obama was not uncovered, and was perfectly modest. Why such pettyness????? May I say that Michelle Obama has been criticized from day one on everything she does. Her fashion, her fist bumping etc., I wish the media/public would end this unnecessary barrage of criticizing her constantly. When she had her portrait done for the Whitehouse, a person I know said she should not have worn a sleeveless dress. I do remember that Jackie O, while in the Whitehouse wore many sleeveless dresses. Get a life people!! Wearing black when attending a wake or a funeral is a Western practice! Her attire would not be appropriate in the West. She deliberately chose to turn a trip to mourn the deceased into a political statement about Saudi Arabia, thumbing her nose at their culture, ceremony and tradition. Michelle Obama is a buffoon and an embarrassment to the United States of America. She wasn't attending a funeral, so why dress in black? It's illiterate people like you Charlie, who don't even read stories before commenting, who give Americans a bad name. Actually, wearing black is not a western practice (at least not anymore). I can't even remember the last time people wore black at a funeral except for when I was living in Egypt. I went to a funeral here in Canada and I wore green and no one else was wearing black, even the family. She was on Saudi Arabia, not Tulsa, OK, her dress was totally acceptable except for some religious conservatives. She is not paying respects to the late King Abdullah, who is no longer there; he has been interred. She is paying respects to the family, the new King, and to all of you and she is NOT required to cover her head for that, as a Western Female Visitor. Get a grip on yourselves and stop gossiping over nothing. Saudis on Twitter can go to blazes with their criticism. 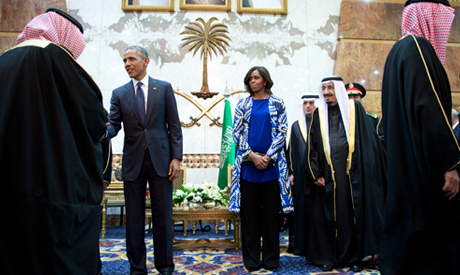 Ms Obama is NOT required to cover her head as a Western female visitor to the Kingdom. She exercised the OPTION to NOT cover her head; she is not in a mosque; she is visiting dignitaries with her husband, the President. Use your criticism to do away with YOUR having to cover YOUR heads, why don't you? Complying with the religious expectations of dress when visiting a church or mosque is entirely different than adhering to someone else's religion during a diplomatic meeting. If a female head of state, or wife of a head of state, who normally wears a headscarf were to visit the Whitehouse, would you expect them to remove it? I think that Michelle Obama struck just the right balance between dressing modestly and honoring her own convictions. As a liberal, western woman I am offended by the notion of hijab, and infuriated at the sight of a woman in full niquab. My equal rights were hard won and I resent a culture that subjugates women and separates them from full participation in society. To me, the hijab is a symbol of patriarchy and misogyny that objectifies women and makes them responsible for the actions of men. I do not give the west a pass, as there is still much sexism here, but gender segregation and covering up women is not the answer.